At ATS Euromaster our range of Mini tyres are competitively priced and with over 330 centres around the UK, you can book online at your local centre, saving you both time and money. When you buy Mini tyres you can also arrange tyre fitting at home or at work, so one of our trained technicians can change your tyres at a time and location to suit you. 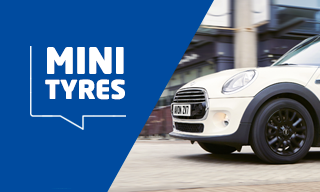 There are a wide range of Mini models on the market at the moment and we stock a variety of suitable tyre patterns and sizes although we would advise you check your individual vehicle to verify the size of your current tyres before placing an order. The Mini Cooper range is one of the most popular from the marque, praised for its responsiveness and style. Again these models are fitted with Pirelli's Eufori runflats, however the Pirelli P3000 is an alternative fitment. The pattern is designed to cut costs associated with motoring through its rolling resistance reduction component, which reduces fuel consumption, making it an ideal tyre to fit to the model. Bridgestone's Potenza, Dunlop's SP Sport 01 and Goodyear's Excellence products can also be fitted to the Mini Cooper range and perform well. The Mini One provides good, solid handling on the road and is one of the most popular models produced by the firm since BMW bought it in 2001. It is available in a range of models, including the Convertible, the Clubman, Hatch and Countryman. The models come fitted with Pirelli P7 tyres, but if you're looking for something different, the Goodyear NCT5 can offer a little extra grip, a reduced chance of aquaplaning and these tyres also limit road noise for a more comfortable ride, while the Avon ZZ5 is also a good replacement pattern. The Mini Countryman is a compact crossover and boasts a longer wheelbase, more interior room, and higher ground clearance than many other Mini models. It is fitted with Pirelli runflats, which means the vehicle can be driven around 150 miles at 50mph without needing to change the tyre, providing you with the opportunity to find the nearest ATS Euromaster centre. They can be recognised by the RSC logo on the sidewall and should be replaced with a similar product. As runflats are fitted as standard, there are a limited number of replacements, but the Dunlop SP Sport 01, the Goodyear Excellence or the Continental ContiPremiumContact are all good options.